The weather has been storming for the past three days--drenching rain, wind, and lightening. In spite of it, little Violas are showing their faces in yards up and down the block. They look at the weather and all its energy like curious children anticipating the sunshine. 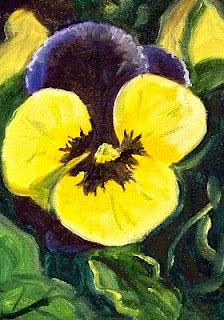 The glimmer of spring these little flowers bring is what inspired this 5x7 inch painting. I'm not typically a painter of florals, but with ugly weather, their color is encouraging my efforts. When this one dries, it will be listed for sale in my online gallery, Small Impressions. 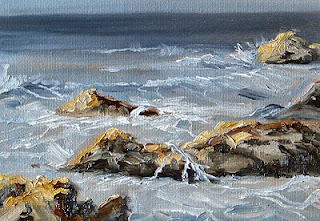 Drop in and see the small format oil paintings that are for sale there. Most of the time when I paint water, the colors feel exaggerated. After all, I live in the Pacific Northwest where the sky is often gray and rain visits often. We don't have water that is ultramarine blue or any of the other available blue paint that I own. Since I can never seem to get the color right, I've abandoned painting seascapes for some time now. But, then I remembered a little exercise from the past and tried it on this little 5x7 inch oil painting. My palette is limited to Chromatic Black, Titanium White, Burnt Sienna, and Yellow Ochre. The trick is that there is no blue, but the shades of gray take on the appearance of blue. Finally, the color of the sea off the Pacific Northwest Coast! It was a good reminder that an artist can do a lot with a limited palette. This little 5x7 inch oil painting is now available for purchase at the online gallery, Small Impressions. It represents the calm of a winter shoreline and was inspired by the stillness of a winter day. The painting will fit in a standard sized frame and might be displayed with a collection of other small format paintings. The price is $50.00 plus $6.50 for shipping to US addresses. Click here to put it in your shopping cart. The season for new beginnings is almost here. Baby chicks have always been a symbol of birth and new life, and painting this one was a new challenge for me. 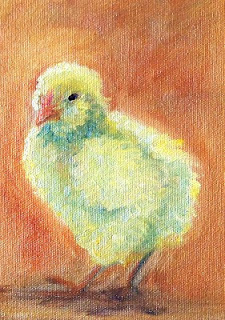 She was born on a 5x7 inch Raymar Canvas Panel, created with oil paint, and can be purchased for the Easter holiday by visiting my online gallery, Small Impressions. For $40.00 plus $6.50 for shipping to US addresses, she will move from my home to yours. 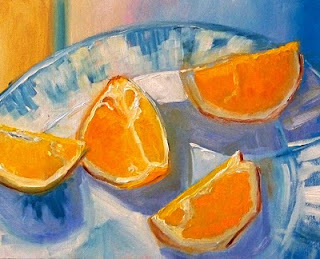 She will easily fit into a standard size frame or might be displayed on a small table top easel though she is sold unframed and purchase does not include an easel. 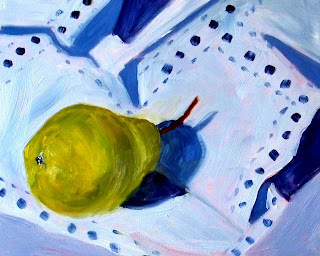 Bright sunshine and a pear on a lace cloth formed the inspiration for this 8x10 inch oil painting. The pattern of the lace was the biggest challenge. I kept reminding myself to suggest the lace and avoid getting caught up with detail. The suggestion seems to have worked. Floral paintings are not my usual, but some recent spring weather has caused me to think of flowers. This little 4x6 inch bouquet was so fun to paint, I might do some more florals. I began with the dark centers and worked from dark to light, painting shapes and trying to remind myself to consider shape and color and not think about painting a flower. It worked and I am delighted with the results! This painting can be purchased online at my Etsy Gallery, Small Impressions, for $24.00 plus $6.50 for shipping to US addresses. When I painted this 5x7 inch oil painting, loose strokes and texture were on my mind. Shape and color helped the abstractions of this piece take shape. I espcially liked the combination of the complimentary colors. 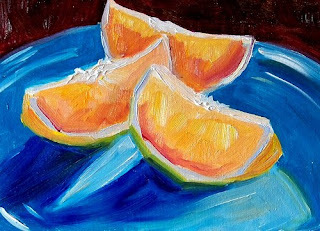 It has been removed from the drying rack and has joined some of my other small still life oil paintings at Etsy. Please stop by and visit. Purchase this painting for $50.00 plus $6.50 for shipping to US addresses by clicking here. Lately I've been working on painting the effects of bright sunlight on objects. With the sun coming in from a nearby window, the contrast between shadow and sunlight is intensified. Often I fret about the contrast and am tempted to tone it down, but if I leaveit alone, I'm usually happier with the results. This painting is 8x10 inches on a hardboard panel, and except for the challenge of photographing it, I'm happy. Enjoying the sunshine of spring yesterday, reminded me of the distant rewards of summer and inspired me to add this pair of tomatoes to my painting efforts. When I'm inspired, it seems like a painting just creates itself. Somehow the paint slides off my brush into just the right place. This painting is 5x7 inches and when it dries, it will be listed for sale at my online gallery, Small Impressions along with some of my other small still life oil paintings. A little slice of orange and a bicycle ride made for a great Saturday. I spent a couple of hours in the studio then enjoyed the sunshine on this first day of spring. The temperature rose into the 60's, an amazingly high level for this time of year. 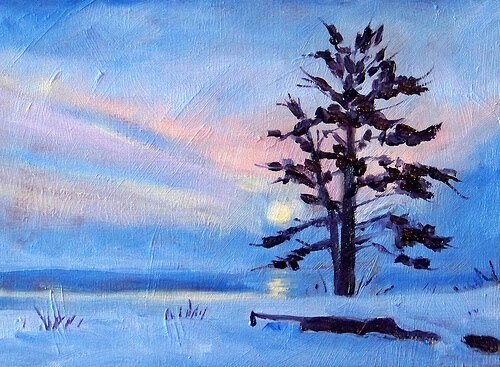 This painting is 5x7 inches on a Raymar Panel and can be purchased for $50.00 plus $6.50 for shipping to US addresses. It is my first painting of the spring season. Click on this link to put in a shopping cart and purchase it from Small Impressions Gallery at Etsy. Quick, painterly strokes helped me created this 5x7 artichoke painting. It was fast and fun. I began with a neutral base coat on a hardboard panel. When the base coat dried, I sketched the shapes, painted the background, the shadow, and finally put the artichoke on top. Since the artichoke had so many leaves and I knew trying to paint each one would challenge my patience, so I focused on shapes, forgetting about the leaves. It makes it so much easier to paint when I force myself to forget about what I'm painting and look for shapes and colors. Thus, when finished, it was an artichoke! In a few weeks it will be for sale at Small Impressions Gallery. 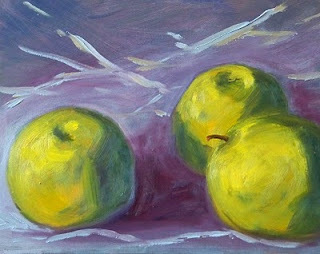 Until then, you might want to take a look at some of my other small still life oil paintings. Another day, another dog. As this guy cruised along the sidewalk, I was attracted to his confidence and the fluff of his tail. He seemed to know where he was going and that tail was like a flag telling everyone to pay attention. The painting is 5x7 inches on a Raymar panel and was loads of fun to paint. Visiting the dog park is exciting for so many reasons. There are dogs of all sizes, shapes, and personalities. This little fellow was so happy to be alive. He wiggled and wiggled and couldn't get enough of the people and other dogs that he met. 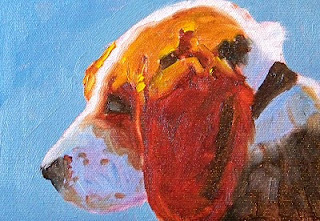 Today's 5x7 inch painting was inspired by his enthusiasm for life and the fact that he was having such a happy dog day. This sweet little Beagle is the Dog Park Lover. He greets everyone with a wiggle of the tail a skip and a hop. He plays nice with the small dogs, but isn't afraid to mix it up with the big guys, too. A few moments of blue skies and sunshine on his face encouraged me to paint this little 5x7 inch version of him. Visit my Etsy Gallery, Small Impressions, to view some of my other animal portraits. Trying to catch that sunlight that streams through my window onto these green apples was the challenge of the day. One minute I had warm sunlight streaming in, then the clouds appeared and the light shifted. Guess I'll just leave it at that. 8x10 inches--oil on hardboard. Painting this little collection of sheep was fun. I find these animals to be so cute and curious that every once in a while their portraits have to emerge. This trio, poised in a field late in the afternoon, are wondering what their onlookers have in mind. The painting is 5x7 inches on a canvas panel. It can be purchased for $35.00 plus $6.50 for shipping to US addresses at this link where you can use Paypal to put in your shopping cart. 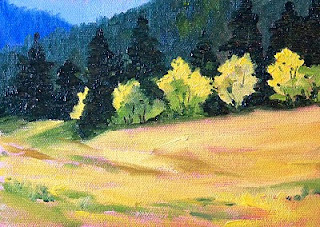 A little 4x6 inch oil painting is today's featured art. 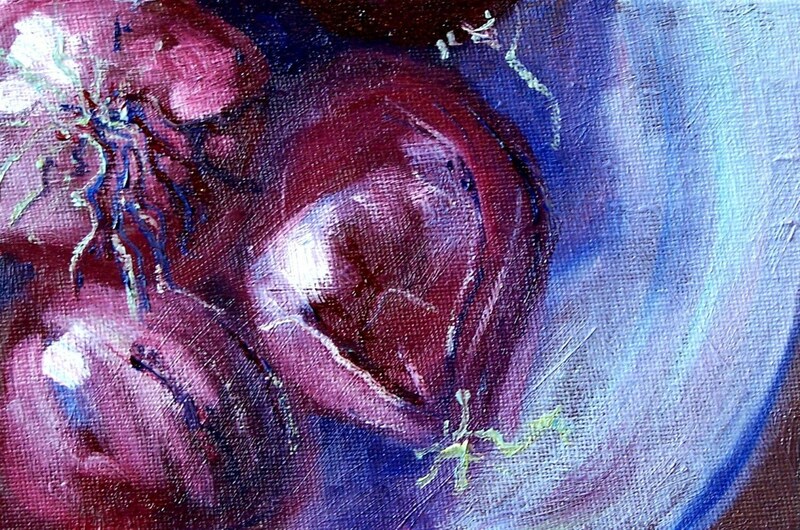 The color and light of these little purple onions inspired my work. 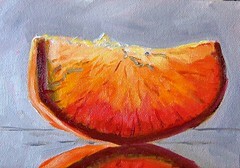 It would make a great little addition to a kitchen art collection of fruits and vegetable paintings. You can put it in your shopping cart for $24.00 plus $6.50 for shipping to US addresses and have it delivered in just a few days. 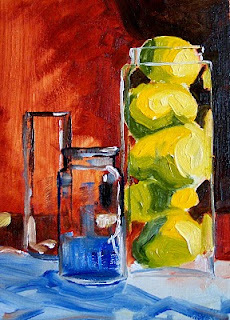 Visit this link to see more of my small kitchen paintings. A Washington State treat is visiting the Nisqually River at Mount Rainier. The head waters come from the glacier that flows off the mountain and eventually spills into Puget Sound. 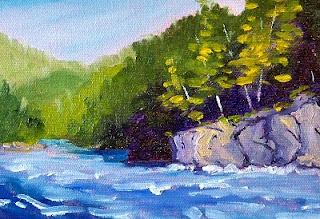 This painting was inspired by a visit to the river and was created on a 1/4-inch panel that will last a lifetime--much nicer than a postcard! It can be purchased for $50.00 plus $6.50 for shipping to US addresses. Click here to put it in a shopping cart and have it delivered in a few days. This little 5x7 inch oil painting is one of my favorites. I like peeking at the mountain side through the evergreen trees. The painting is for sale at Small Impressions Gallery for $50.00 plus $6.50 for shipping. Click here to access the Gallery and put it in your shopping cart! Red paint can be a challenge to work with. To create the values required to replicate a three-dimensional object using red demands practice and preparation. 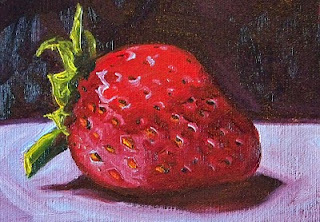 I think I was able to pull it off, more or less, with this large strawberry on a 5x7 inch panel. The past couple of days I've been cleaning out the studio and now I'm ready to move some of my paintings out of storage and into new homes. This painting is 8x10 inches on a gessoed hardboard panel. I've always like the texture and painterly feel of it, but it has to go; I'm out of storage space. It is for sale online at Small Impressions Paintings for $125.00 plus $12.00 for shipping to US addresses by clicking on this link. I'll be sad to see it go, but am in need of some space. It's time to get outside and begin enjoying the spring weather. 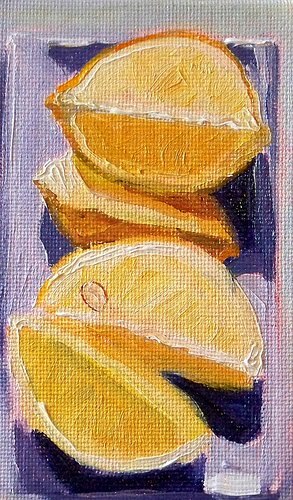 Sunshine and warmer weather inspired this little 5x7 inch painting. It's still cold, but days are getting longer and skies are showing some blue. 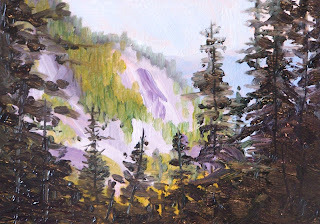 Painting the vast forests of evergreen trees in the Pacific Northwest is an ever present opportunity. It has been a quite a while since I've painted a landscape that included evergreen forests as an element, so it was time. 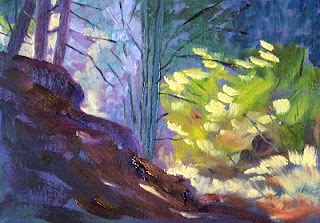 In this little 5x7 inch oil painting, the deciduous trees on the edge of the forest were supposed to be my focus. Getting the values in the distant forests correct was the challenge. I'm not particularly happy with the results. The most distant hill of trees works well, but the mid ground trees are too dark and don't show an effective contrast with the evergreens in the foreground. When the paint dries, I may tweak those values a bit more. This painting is a reminder to me of how quickly skills can disappear when practice isn't frequent. 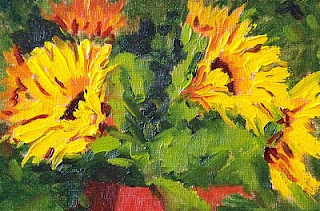 It took a while, but this little 5x7 inch oil painting and its companion piece are now for sale at my Etsy Shop, Small Impressions Paintings. Both paintings were created while on a trip to the Washington Coast. Since the paint was wet, I left them to dry and didn't make it back to pick them up for several weeks. Finally, I was able to transport them home again. They can be purchased for $50.00 each plus $6.50 for shipping to US addresses. Just visit the shop! Today's painting was created qute a while ago, but I was so challenged with photographing it that the posting is quite late. The first time it was photographed, the paint was still wet. The dark areas on the lower left glistened with reflection and produced a photo that was so unlike the original paintng that I couldn't bear to share it. After the paint dried, I tried again. Still there was some reflection and the color wasn't true. So, this is my third attempt. The glare and reflections are still present, but reduced considerably and much more like the original than any of my previous attempts. 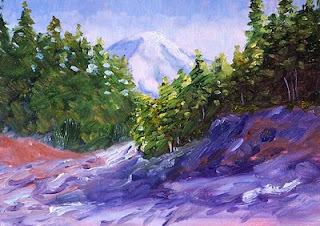 It has joined some of my other small landscape paintings at Small Impressions Gallery at Etsy. This little painting is 5x7 inches and will sell for $50.00 plus $6.50 for shipping to US addresses and can be purchased with a click right here.